OneDrive integrates with Microsoft Office, so users can easily access Word, Excel and PowerPoint documents anywhere through the cloud. The system allows users to simultaneously edit documents and create and share folders. Need to share property photos that are too big for email? 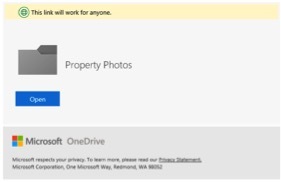 Share a link to the folder using OneDrive! It is a great way for you to manage your property content between your smartphone and your computer. Hootsuite is a social media management tool. 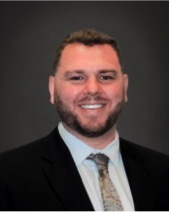 It allows the savvy CRE Agent to post content seamlessly to each of their social media accounts. Including Facebook, Twitter, LinkedIn, Instagram and more. Overwhelmed with the idea of getting yourself found online? Engage with your audience using automatic content scheduling. Track the engagement with real-time analytics. Try Hootsuite. You might just love it! If you are a Google user and are looking for a simple customer relationship (CRM) tool check out Streak. There is a free version as well as a paid professional package. 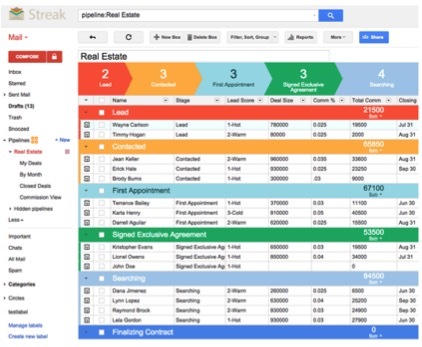 Streak can be added as a Google Chrome extension and your Commercial Real Estate leads and deals can be placed at the top of your Gmail inbox. Your deals can be organized using colorful headings. Simply click on a deal to see contact info and previous interactions. You can create different message templates, save deal views, adjust commission formulas and customize your workflow. Microsoft Pix – Photo app and business card scanner. I recently began using Microsoft Pix primarily as a business card scanner. 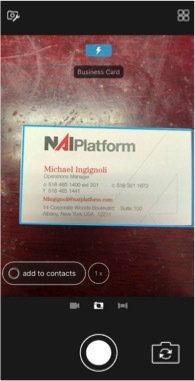 You can hold the phone over a business card, it will recognize the information, then give you an option to add the contact. It can get hard to keep track of all the cards we collect at networking events. Using Pix can help you keep track of who you spoke to and who you had a real connection with. Oh, it’s also a handy photo editor too. Brighten up a dark office or add a filter to an empty lot to liven it up. Then you might share that photo using Hootsuite! 5. Notes – Yes. Notes. 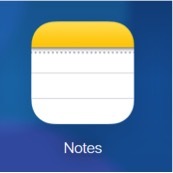 Last but certainly not least is your Notes app. I can’t tell you how often I recommend a Notes app. All our smartphones come with a Notes app included and there are many more available for download (Evernote, Notability, OneNote). I use my notes app to keep track of all my passwords and banking information. Luckily the notes app on Iphones allows you to keep a note locked by passcode, fingerprint, and even FaceID. You can share a note between multiple people who can make edits and track changes. Keep a running list of your client’s needs, jot down floor plan measurements, keep a list of recommended vendors, the list (that I keep in my notes) goes on.